I am involved in several online caregiver support groups. Sometimes I actively participate and sometimes I look at the comments and information posted but scroll past without commenting. Most of the time I am heartened by the love and care people show one another. Occasionally, though, I cringe when scrolling through comments made to people reaching out for help. The majority of the time people are kind but sometimes people are judgmental and harsh and impatient toward other caregivers. People in similar situations! Every caregiving situation is different with different people doing their best caring for loved ones in a variety of situations. Caregivers can be in different stages of caregiving, can have other life situations that make their situation difficult and can have different emotional strength and attitudes at this particular time in their lives. It is important to remember that each of us is only who we are at this moment in time in this set of circumstances based on our past experiences and our hopes for the future. Everyone is different and it does not help to make someone feel guilty because they are not handling a situation as well as we think they should. Caregivers can help themselves and others keeping these reminders in mind. Listen instead of comparing yourself to other caregivers. Please. I have never met a caregiver who thinks their situation is the worst. Caregivers may think they have it difficult but most think someone has it worse than them – no matter the situation. It is not helpful to minimize our caregiving situation (or someone else's) because another caregiver’s situation seems worse (or better) than our own. It doesn’t matter. Each caregiving situation is different yet we all go through the same emotions, struggles and heart-wrenching decisions at some point. Be supportive instead of judging other caregivers. Robert goes to a Day Program and he sleeps a lot. My husband is my co-caregiver and gives me a tremendous amount of help with Robert. He has lived on his own, in a Skilled Nursing Facility, in an Assisted Living Facility, was living in a Residential Home for the Disabled. Each of these situations is difficult in its own way. I know other caregivers who made the decision to permanently place their loved one in a facility and they are either relieved, devastated or a little of both. There are caregivers who work full-time and have to leave their loved one at home with the knowledge they could have a devastating seizure or fall at any minute. These caregivers are worried sick enough and need support, not judgment or a declaration that they are not “real” caregivers because their loved one lives elsewhere or is not cared for by them 24/7. Educate instead of thinking less of other caregivers. Here’s my confession: I was unsure how to put a brief on my 220 lb incontinent, adult brother. I know how to put a diaper on a baby but a standing, wobbly adult? I struggled. At first I needed an extra hand or two to get it on snuggly and, I actually wasn’t even sure at first if the tabs should go in the front or back! (The tabs go in the back and then tape to the front of the brief.) Help new caregivers learn the basics without making them regret asking the questions. Recognize when we want to vent instead of problem solving. Sometimes we are losing our minds when caregiving and have no one to talk to. Let us rant and rave and tell you how tired and awful (and then guilty) we feel without telling us it is time to put our loved one in a home or that we need a vacation (especially since respite is so difficult to get sometimes). Let’s laugh together and not always be so serious. Caregiving is full of serious health issues, impossible medical decisions and extreme concentration so mistakes are not made. But we can’t be serious all the time! Caregivers know (but may not admit) that there can be some very funny caregiving situations. We have to laugh! Whether we laugh together or alone let’s at least recognize the absurdity of some of our caregiving situations! Some of the best friends I made while caregiving are ones I could laugh with about our crazy situations. Everyone knows caregivers need more support from non-caregivers, from the government, from our employers and from our families but we also need support, love and kindness from each other. We can all use more kindness in our world so let’s keep this in mind when dealing with each other. Let’s also remind ourselves to be kind not only to one another but to ourselves. We can do that for each other. We created another Stay at Home Respite this weekend like we did in March when actual respite fell through. We decided it was time to do it again. I am not going to lie: it would be really nice to have a “real” respite. It would be wonderful if I didn’t have to always wear a watch with a second hand available to time Robert’s seizures (which have been awful this past couple of weeks). It would be a relief not to have to do several loads of laundry every day. It would be a nice break to have a relaxing dinner instead of prompting Robert to eat so his usual 90 minute meal doesn’t turn into a two hour event. I have it lucky, I know. I know this! I am lucky that Robert has a Day Program he loves and goes to four or five days a week (depending on his seizures, doctor appointments and level of tiredness). I am lucky that my husband helps me care for Robert and doesn’t complain about any of the tasks involved. Yes! I am incredibly lucky as a caregiver! I have a better situation than many, many caregivers. I do understand this and don’t mean to whine. “Real” respite doesn’t happen because the options we have for care facilities are limited. Robert is serviced through the local Regional Center and as his caregivers we are allotted 14 days per year. WOW! I can’t even imagine needing 14 days every year. I would like just a couple of days every now and then. Next year, I would love to have a week when my daughter is getting married but, other than that, let’s just have a weekend! Me: Hi, [Service Coordinator Name]! I would like to set up a weekend respite. SCN: Great! I have several homes available right now. Let me know when you want to schedule. Me: How about the weekend in three weeks? We’re flexible so let me know if another weekend works better. SCN: Well, we are down to one home with availability. Me: I’m confused. I thought you had several homes available. SCN: Some of the homes don’t accept people in a wheelchair or only accept female clients. It doesn’t look good for this last home now either. Oh, I see. So I can use my 14 days when Robert becomes a woman and is no longer wobbly and a fall risk when he walks? Is that a puppy on a unicorn in a field of sunflowers up ahead? Forget about the 14 days. If it makes the State feel better about itself for providing this “benefit” then so be it. I will go to Plan B. Plan B is my Stay at Home Respite. Some caregivers may get upset about me calling this respite but it helps me. Yes, my days will involve the same amount of medication and alarms and bathroom clean up duty (and possibly seizures) but I am going to do something a little different and have a little different attitude before I lose my freaking mind! SO I WILL CALL THIS RESPITE, THANK YOU VERY MUCH! During my respite, I think it is important that Robert do something a little different too. He enjoys a break from routine like the rest of us! My plan was to do something different for Robert on at least one day and to do one thing out of the ordinary every day for me and Richard. Richard and I were even fortunate enough to go out on a dinner date thanks to our daughter staying with Robert. Rach insisted it was no big deal since Robert was already in bed but she kept an eye on him, kept him in a steady supply of Family Feud episodes and gave him his bedtime medication. She may not think she did much but she did. Allowing Richard and I to spend a few hours eating dinner out and being able to talk about things not related to caregiving (although we did some of that too) was a huge help. Not having to worry about whether there is enough space at the table for a wheelchair or if they have a bathroom that can safely accommodate the wheelchair, Robert and one of us gave us a much needed break. Dessert was so delicious I forgot about the "before" pic! This may not be considered a “real” respite but it was enough for now for us. I am still tired but I am grateful for the extra time spent with Richard. I am grateful for a fun afternoon with Richard and Robert seeing a movie. I am grateful for a job that provides paid vacation days. I am grateful for a daughter who helps without complaint (and one who loves a manicure as much as I do!). And to the State of California: You can have your 14 days. Caregivers are creative! We can make the most of a situation with or without your help. I am satisfied with creating my own respite to give me a boost of energy which, hopefully, will last me another six months. 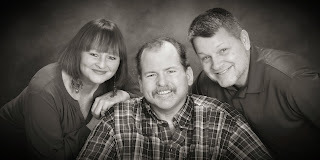 I am grateful for the help from Richard and Rachel and the positive attitude that Robert has 99% of the time. I know I am lucky and now, after a made-up, patchwork of respite, I am just a little less tired and have a much better attitude. Yep, I am lucky and grateful. Although I could use just a bit more of that lava cake!